Can you feel it? That extra-special feeling you have for your country and for the ideals that this country stands for? That’s the warm, delicious embrace of patriotism. It’s the kind of feeling that can keep you feeling nice and toasty inside, but sometimes, even the glow of pride for your country isn’t enough to combat the icy tickle of chilly breezes. 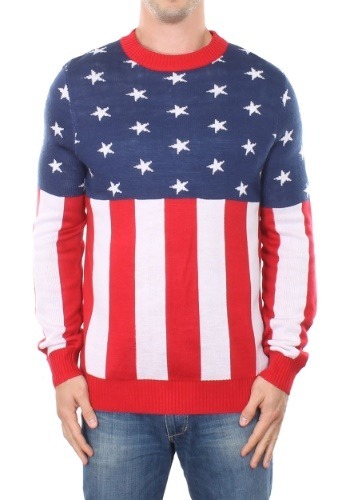 Sometimes, you need to combine that patriotism with something else… like a sweater. Now, there’s a sweater that combines the sizzling hot passion of patriotism with comfy apparel that you can wear all through the winter! This adult American Flag Holiday Sweater helps you express your patriotic feelings no matter what the weather! This soft sweat is made from acrylic and comes in a classic crew neck style. The top is navy blue with a white star pattern, while the bottom portion is covered in red and white stripes, just like the American Flag. 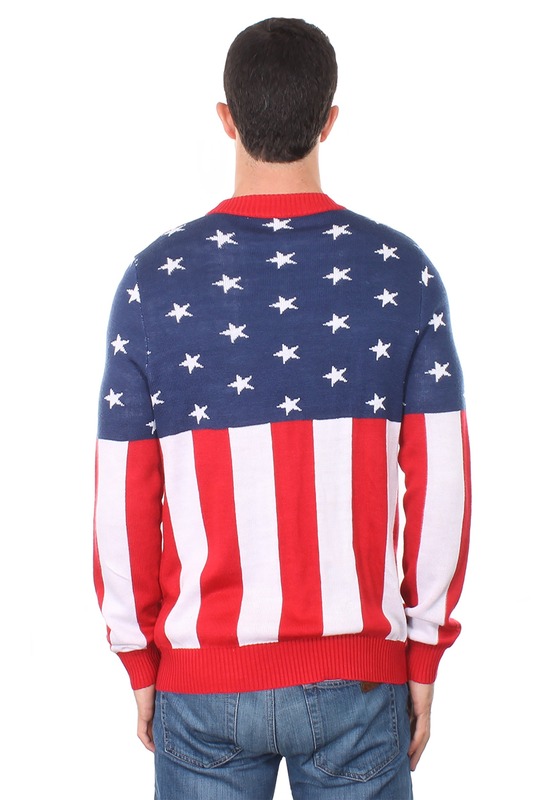 Just slip this sweater on for the holidays or wear it any time you want to express your love for the good ol’ U.S.A. It looks great with a pair of jeans and there’s really no bad time to wear this comfy sweater!